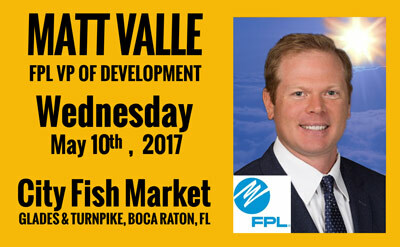 Matt Valle is the Vice President of Development at Florida Power & Light (FPL) in Juno Beach, Florida. In his role, Matt is responsible for leading the new generation development for the company across technologies including solar and natural gas. Currently, his team is responsible for the development of 600 MW of solar in 2017 and brought online 225 MW of solar in 2016. In addition, his team is actively developing a 1750 MW natural gas facility and deploying battery storage and small scale solar across FPL’s territory. Prior to his current role, Matt was Vice President of Development at NextEra Energy Transmission, and was responsible for the competitive development of transmission across the U.S and Canada for the company. He will be speaking to the Gold Coast Tiger Bay Club on May 10th, 2017 at City Fish Market in Boca Raton, FL.